Here is a recent video interview I did with Professor Donald Harper, centennial professor of Chinese studies at the University of Chicago. Dr. Harper is a specialist in early Chinese medical manuscripts and the period of Chinese history from the Warring States to the Han dynasty. Photo of the Wu Shi’er Bing Fang (Prescriptions for 52 Ailments), found at Mawangdui (1973 CE). The interview begins with a brief description of the history and context of the Mawangdui medical manuscripts that were unearthed in Hunan province in 1973. 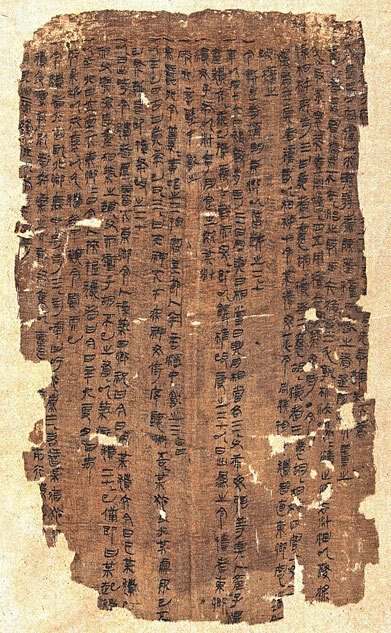 Dated to 168BCE, these manuscripts include some of the earliest extant material on 脉 mài (vessel) theory, 导引 dǎoyǐn (guiding and pulling) exercises, sexual cultivation techniques, herbal medicine, and longevity practices. Using Mawangdui as a starting point, Dr. Harper shares his insights on early Chinese medicine and discusses some of the recent archaeological discoveries, including the tombs at Laoguanshan, which contain a number of texts believed to be the work of the legendary 扁鹊 Biǎn Què or his disciples. Along the way, Harper describes the “open fluidity” of medical ideas found in these ancient texts, which predate the more ideological 黄帝 Huángdì literature, and defines several terms that appear in the early literature, including 神明 shénmíng (spirit illumination). The interview concludes with Dr. Harper’s description of a small lacquer figure that was found at the Laoguanshan site. For the first time in English, Harper details how markings on the figure itself provide new clues into 五行 wǔ-xíng (five agent) theory and 脏腑 zàngfǔ (organ) theory!